This is the first in a multi-part series that will focus on the growth, investment, and M&A trends in the solar photovoltaic (PV) industry. Solar photovoltaic (PV) cells convert sunlight directly into electricity. Commercial utilization started in the 1970s and 1980s. In 1973, Karl Böer from the University of Delaware built an experimental house called the Solar One, the first house to convert sunlight into energy. The first solar PV megawatt-scale power station (1-megawatt capacity), developed by ARCO Solar, went on-line in Hesperia, California in 1982. The adoption of solar energy has been rapidly expanding ever since. According to new research, more investment went into solar than any other power source last year. The renewable source attracted $160.8 billion in investment, with a record 98 Gigawatt of new solar capacity installed, according to a new report from UN Environment, Frankfurt School – UNEP Collaborating Centre and Bloomberg New Energy Finance. This fact implies that solar accounted for 57% of the total for all renewables, excluding large hydro, of $279.8 billion. In comparison, new investment in coal and gas power plants was estimated only at $103 billion last year. The industry employs over 370,000 people directly or indirectly in the United States. There are estimated to be over 160,000 solar PV installers in the country and they are considered one of the fastest-growing jobs with a median salary of about $40,000. Worldwide growth of photovoltaics is dynamically changing. Total photovoltaic capacity increased by more than 75 gigawatts (GW) and reached, by early 2017, 303 GW, sufficient to supply 1.8% of the world’s consumption of electricity. More than 24 countries around the world have a cumulative PV capacity of more than one gigawatt. The top installers are China, the United States, Japan, and India . Austria, Chile, and South Africa surpassed the one gigawatt-mark in 2016. Honduras is now sufficient enough to supply 12.5% of its electricity by solar. Moreover, Italy, Germany and Greece can produce from 7% to 8% of their own electricity consumption. Currently, by market share, the top 3 solar panel manufacturers in the world are Trina Solar, Jinko Solar and Canadian Solar respectively. Sunrun and Vivint Solar dominate the solar installation in the U.S. Within the U.S., a number of players are owning and operating solar PV projects. Solar resources are not distributed equally across the country. Surprisingly, with abundant solar resources, Texas is currently not near the top when it comes to the utilization. However, it ranks the first in terms of wind energy development. 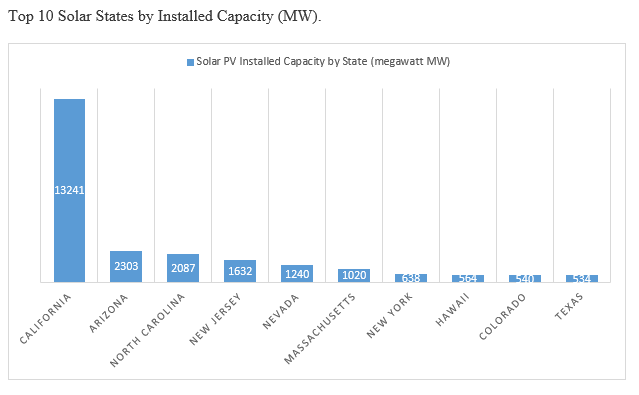 California has been adopting solar PV power far more aggressively than any other states in the US, which results in them using nearly half of the nation’s solar PV capacity. Within the US, nearly 50% of utility-scale capacity installed in 2017 is from renewables, and about half of that came from solar power. However, solar trade tariff and tax codes could potentially interrupt that trend. According to research, the tariff alone might reduce solar installations by over 10% from 2018 through 2022. Even though the US invented this industry, China has poured up to $47 billion into tax breaks and incentives to develop a strategic capability. Over 80% of solar panels installed in the United States last year were manufactured outside of the US. Along with the accessible supply of cheap labor, these investments reduced the price of solar panels by 80% within five years from 2008 to 2013. In the first quarter of 2018, the U.S. market installed 2.5 gigawatts of solar PV, a 13% year-over-year increase. Total installed U.S. PV capacity is expected to more than double over the next five years. By 2023, 14 gigawatts of solar PV generation capacity are expected be installed annually. Yi Xie contributed to this report. Diarmaid Williams, Solar tops rankings for 2017 global power investment-Solar tops rankings for 2017 global power investment (2018), https://www.powerengineeringint.com/articles/2018/04/solar-tops-rankings-for-2017-global-power-investment.html (last visited Aug 21, 2018). Joshua D. Rhodes & Research Fellow of Energy, The state of the US solar industry: 5 questions answered. The Conversation (2018), https://theconversation.com/the-state-of-the-us-solar-industry-5-questions-answered-90578 (last visited Aug 24, 2018). Nye Longman, Top 10 solar-producing countries. Utilities | Energy Digital (2017), https://www.energydigital.com/renewable-energy/top-10-solar-producing-countries (last visited Aug 26, 2018). IEA International Energy Agency, REPORT, http://www.iea-pvps.org/fileadmin/dam/public/report/statistics/IEA-PVPS_-_A_Snapshot_of_Global_PV_-_1992-2016__1_.pdf (last visited Aug 26, 2018). 10 Top Solar Panel Companies & Manufacturers for 2018 | EnergySage,ENERGYSAGE(2018), https://news.energysage.com/best-solar-panel-manufacturers-usa/ (last visited Aug 26, 2018). Top 25 US utility-scale PV project owners, SOLAR ASSET MANAGEMENT: NORTH AMERICA (2017), https://solarassetmanagement.us/news-source/2017/1/13/top-25-us-utility-scale-pv-project-owners (last visited Aug 26, 2018). American Wind Energy Association,WIND ENERGY IN TEXASWIND ENERGY IN TEXAS(2018), http://awea.files.cms-plus.com/FileDownloads/pdfs/Texas.pdf (last visited Aug 26, 2018). Here Are the Top 10 Solar States in the US. Did Yours Make The List?,CLIMATE REALITY(2016), https://www.climaterealityproject.org/blog/where-solar-booming-america-here-are-top-10-solar-states (last visited Aug 26, 2018). US Solar Market Adds 2.5 GW of PV in Q1 2018, Growing 13% Year-Over-Year, Solar Energy Industries Association(2018), https://www.seia.org/news/us-solar-market-adds-25-gw-pv-q1-2018-growing-13-year-over-year (last visited Aug 26, 2018).